Low Season - Pick n Mix Weather! 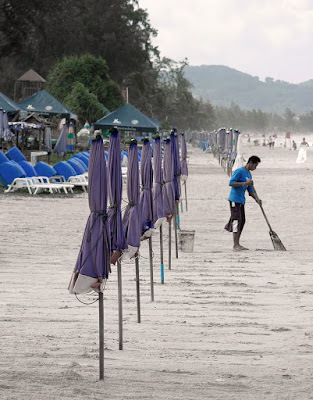 Let's start by saying - YES, it's low season in Phuket and on the west coast of Thailand now. The winds are blowing from the west / southwest and so that means it is officially the (scary sounding) South West Monsoon season. The word "monsoon" makes people imagine non-stop rain and howling winds and typhoons and ... that's actually a load of nonsense. The word "monsoon" refers to the wind, and we have another one in high season - the North East Monsoon. Weather in the last week has been all over the place. For regular updates on the weather and Phuket news and random links, please do Follow Me on Twitter! This week we have had some sun, some rain, some grey, some blue skies.. I got sunburn on Sunday whilst working outside at our house, it's sunny as I write this, but today we already had some rain, the morning started grey, became very nice, wind is blowing so rain clouds pass by quickly. So far in May I have measured only 48mm of rain at my house.... the monthly average for May is 265mm (see Phuket Rain Averages). Clear skies to the east and a big ol' band of rain heading in from the west. 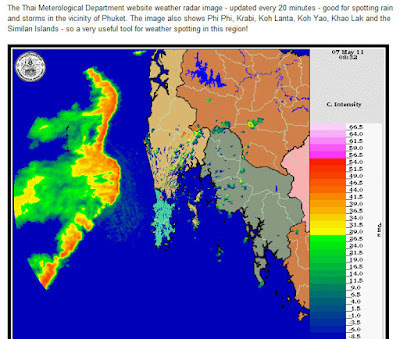 You get this in low season, bands of rain and storms heading in across the Indian Ocean. Sometimes they last an hour, sometimes 2 days. And sometimes they don't come. Low season is a mixed bag - still a good time to come to Phuket, but you should be aware that the beaches might have big waves and possible undertow... please Don't Drown in Phuket! But weather can be sunny even if it's windy, you can do almost anything that you can in high season, without the crowds and hotels are much cheaper! And this morning, nice and sunny. I stopped at Karon Beach for a few minutes to snap some photos. 2 girls were walking along the beach in full bridal gear! Meanwhile a beach chair vendor was sweeping up "his" section of beach. You do get quite a lot of "flotsam" on the beaches at this time of year since the winds are carrying all kinds of stuff over the ocean and it ends up here. Sometimes it looks a bit messy, sometimes it gets cleaned up. 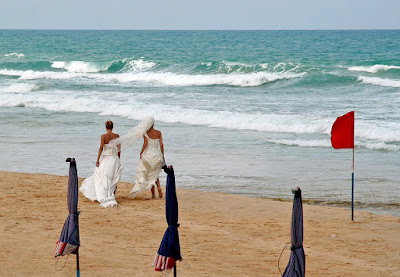 Nice sunny morning - but do notice in the photo of the wedding girls - big waves and a red flag flying. By all means do head to the beach for some sunburn, but then go for a swim in the hotel pool if the sea looks a bit rough.